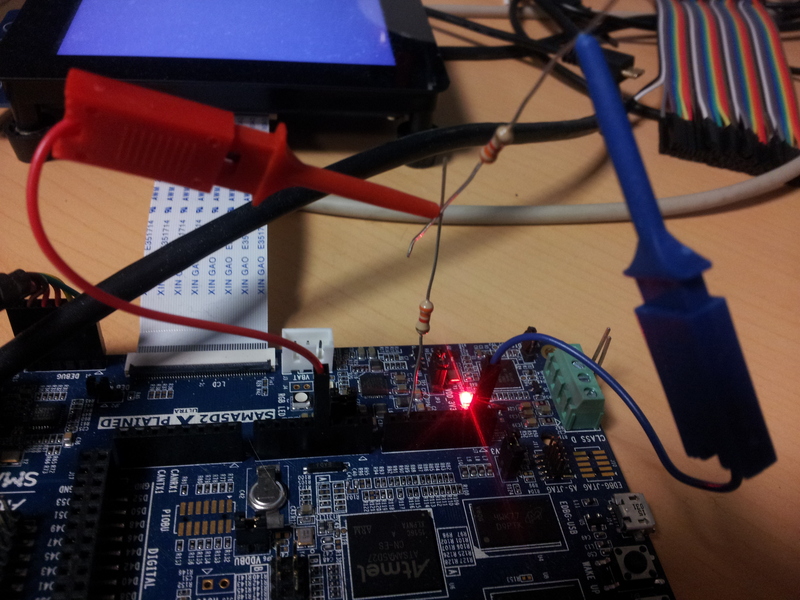 This page describes how to test the features of the SAMA5D2-compatible ADC device. This driver uses the Industrial Input/Output (IIO) subsystem. Documentation for the IIO subsystem is available in the kernel source code directory: drivers/staging/iio/Documentation and Documentation/iio . The ADC drivers is automatically selected if you use sama5_defconfig. Otherwise, check you have set CONFIG_AT91_SAMA5D2_ADC. For example, pins PD20 and PD21 which are connected to ADC input channels 1 and 2 respectively are also used for i2c0 bus. i2c0 bus will not function if the ADC will request these pins for conversion. Hardware triggers are an operating mode of the ADC where conversions are no longer triggered by the software but directly by the hardware. For the SAMA5D2, currently there is one single type of hardware trigger, the external pin AD31, which on the Xplained board is connected on J17 pin 33 (labeled D52 on the PCB). Support for the hardware external trigger has been in kernel mainline since kernel 4.14 and in Linux4SAM releases since 5.7. Since kernel 4.14, we can use DMA to carry our data when using the hardware trigger. Check specific section for details. The external trigger is directly connected to the ADC inside the SoC. The ADC will monitor this pin once it's configured to do so. Once this pin will have edges (from logical 1 to logical 0 or the other way around), these will be detected by the ADC. Inside the device tree, one can configure if the ADC should react on rising edge (0->1), falling edge (1->0) or both type of edges. If an edge is detected, the ADC will start the conversion on all the enabled channels. As opposed to the software trigger which is done on demand by the user with a command (userspace process requesting it ), the hardware trigger and conversion occurs independently on the user. Thus, all the conversion data has to be stored in some buffer, for later retrieval by the userspace. This is why we need to setup a buffer and have an interface to read the data from, if we want to use the hardware trigger. IIO configuration of hardware triggers is also done through sysfs. length : get and set the length of the buffer. in_voltageX_en : is this channel enabled? It also contains the same information for the timestamp, under the in_timestamp_* files. Set up the trigger we want to use (it must be the name of one of the triggers present in iio/devices). Depending on device tree configuration edge type, the trigger name will reflect the edge type that it detects. This means that you can poll() or select() on it to wait for data to arrive, and get them by reading the file, just like you would do with any other file. Then copy the generic_buffer program on your board. Finally, the generic_buffer tool does all the "enable" and "disable" actions for you. You will only need to specify the IIO driver and the trigger you want to use (fc030000.adc and for the trigger fc030000.adc-dev0-external_rising for example). You can also specify the buffer length to use (2 in this example). The default value is 128. 0 is the number of right shifts needed. Starting from kernel 4.14, DMA support is available. By default, DMA is not used, if the watermark of the buffer is set to 1. In IIO context, the watermark is the point of length inside the buffer that once is reached, the buffer will start to throw results into userspace. With DMA activated, each conversion value is not transferred from memory to userspace, until the number of conversions reaches the watermark level. Once this number is achieved, all results are copied at once to userspace. This means that we can achieve a faster conversion rate, because we will not stop the system after each conversion (IRQ, copy_to_user, etc. ), but once every 'watermark' conversions. This means that the DMA will stop once 50 conversions are done (example), and then report the results. If a single edge is detected on the hardware trigger, we should not see any conversion results. This is normal. Linux is no longer interrupted on each trigger, and the DMA will carry the data and notify only when the watermark is reached. Once 50 edges happen, we should see all 50 results in bulk. Tips: Because the generic_buffer application doesn't know how many conversions it prints, actually the parameter "-c 5" means that will wait for 5 times watermark conversions. In our example that is 50x5=250. Tips: If the ADC driver uses DMA, it will report with a kernel notice that it uses DMA , and which channel it reserved. Tips: If the ADC driver stops using DMA and releases the resources, a kernel notice is emitted that ADC driver continues without DMA enabled. Currently in the Device Tree for the ADC, we can see the minimum and the maximum clock for the peripheral. By default, the driver will pick the minimum sample rate of the clock. This means that 200kHz will be used, and we can do a sample with a delay of 21 clocks (datasheet), until the ADC capacitors are loaded. This means we can achieve a theoretical speed of around 8 kSamples/second. With this clock, we can push the ADC, DMA and kernel system to the limit and achieve a higher sampling speed. This could not be achieved if we did not use DMA, because the kernel would be interrupted for each conversion, and it would hog the CPU. During tests in our lab, we could manage to obtain 400kSamples/second until edges were lost. Tips: To get a clean and reliable trigger signal, we can use a PWM pin and configure the PWM subsystem accordingly. Then we can connect a wire between PWM output pin to the ADTRG pin. Tips: An oscilloscope can be used to measure exact number of edges versus the exact number of samples provided by the ADC, to see the reliability. Starting with kernel 4.14 in our release linux4sam_6.0, oversampling can be used to achieve a better resolution for the ADC. Instead of 12 bits, we can use 14 bits. There is a slight ABI change with this support, from now on, reported data is always on 14 bits. This means that the conversion value is in range 0,16384. Without oversampling, the last 2 bits of data are always 0, thus if we shift to the right by 2 bits (or divide the value by 4), the obtained value is the same as before (12 bits, in range 0,4096). This means that we can use 4 samples to get an additional bit. The ADC will do 4 measurements instead of a single one, and report a single value, the average of the 4, with an extra bit set. Tips: The ADC will automatically do the 4 conversions. A single edge is required for the hardware trigger. However, conversion time will take 4 times longer. This means that we can use 16 samples to get an additional bit. The ADC will do 16 measurements instead of a single one, and report a single value, the average of the 16, with two extra bits set. Tips: The ADC will automatically do the 16 conversions. A single edge is required for the hardware trigger. However, conversion time will take 16 times longer.